By Duke Ellington. Edited by Dylan Canterbury, Rob DuBoff, and Jeffrey Sultanof. Arranged by Billy Strayhorn. Ballad. Full score and parts. Published by Jazz Lines Publications (JL.JLP-7378). The song Passion Flower was written in 1941 and first recorded by Johnny Hodges with a small group (arrangement by Strayhorn). On the radio in 1945 the Ellington Orchestra performed a completely different Strayhorn arrangement of this tune. 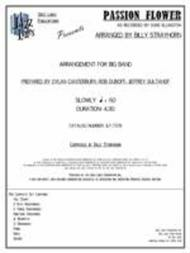 The arrangement published here was written in 1956 by Strayhorn and is an all-out alto saxophone feature. This same arrangement was later recorded by Ella Fitzgerald with the Duke Ellington Orchestra for the Ella at Duke's Place album, recorded in 1965 (lyrics supplied by Milton Raskin). This publication is derived from a complete set of parts, a lead sheet, a condensed score, a copyright deposit sheet, and recordings from 1956, 1962, and 1965. The 1956 recording is available in the Duke Ellington: Complete Studio Albums Collection, 1951-1958; the 1962 recording was released in the Private Collection set; and the 1965 recording is found on the Ella at Duke's Place album. This arrangement is a straight-forward alto saxophone feature. It is marked as difficult due to the trumpet 1 range (F6) and the shout section which is rhythmically challenging. Instrumentation: 2 Alto Saxophones, 2 Tenor Saxophones, Baritone Saxophone, 4 Trumpets, 3 Trombones, Piano, Bass, Drums.